Girl Cupid is so cute. She is so popular around Valentine's Day. Usually Cupid is a chubby baby boy, but now Cupid is a cute little girl with bows and arrows. She is a little fairy and she can float on a sky. 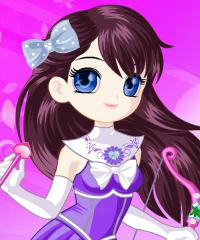 Dress Cupid up in all kind of combinations and choose a pair of wings that you like the most.